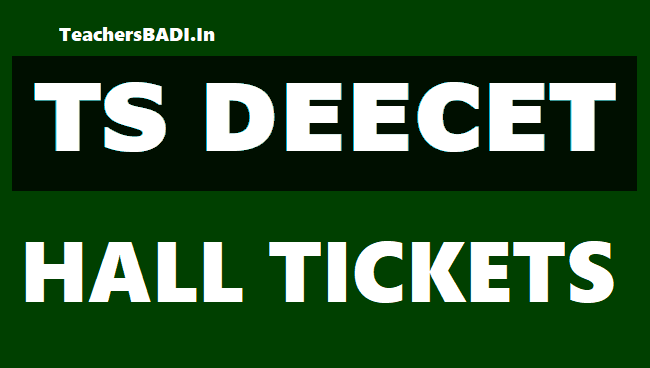 TS DEECET 2019 Hall Tickets, Telangana DEECET hall tickets, TS DIETCET Hall tickets, DEECET Admit cards, TS DEECET 2019 Exam date:TS DEECET Hall Tickets 2019 download,How to Download DEECET 2019 Hall Tickets: After completion of ts deecet online application process, DIETCET Official will provide hall tickets on its web portal. So, Hall Ticket download option would be added soon on web portal. When, option is available to candidates may download their tsdeecet hall tickets with your name and Date of Birth. TS DEECET 2019 Exam will be conducted on 22-05-2019. The TS DEECET-2019 will be held online in May last week. Arrangements have been made to organize the Diploma in Elementary Education Common Entrance Test (DEECET) for admission to DEd colleges in the state by the School Education Department . On 17th day, DSE Telangana is conducting three stages of examinations. DSE will conduct online exams in three sessions, From 9.00 am to 11.00 pm; From 12.30 am to 2.30 pm, From 4.00 to 6.00 pm. The Director (Convener) of the Department said that 42 thousand applications have been received across the state for DEECET. Convener, DEECET 2019, Office of the Commissioner and Director of School Education, Telangana State, Hyderabad:: The Candidates who are appearing for DEECET-2019 Online Test for admission into two year D.EI.Ed. course for the Batch of 2019-2021 are informed that the Online Test will be held on May 22 in three sessions as follows. The Hall Tickets can be downloaded from the web site of tsdeecet.cgg.gov.in and Practice Test is also available for the students in the TSDEECET website. TS DEECET 2019 hall tickets Download at tsdeecet.cgg.gov.in: In case any candidate is unable to download the hall ticket from tsdeecet.cgg.gov.in, she/he should contact the help line by giving the details of the journal Number of the fee paid and the reference ID number of the application submitted. The School Education Department of Telangana has released the hall tickets of the TSDEECET 2019. The examination is scheduled to held on May 22. The students can download the DEECET hall ticket on the official web portal by Centre of Good governance (CGG) at tsdeecet.cgg.gov.in. The TSDEECET shall be conducted online in all 10 districts of Telangana. The online test will be held in three sessions. The first session will start at 9 am and will end at 11 am. Step 2: On the home page, click on ‘Please download hall ticket’ flashing towards the middle of the page. Step 4: The hall ticket will appear. Download and take a print out. In case any candidate is unable to download the hall ticket, she/he should contact the help line by giving the details of the journal Number of the fee paid and the reference ID number of the application submitted. The School Education Department has also made practice test/ mock test available for the aspirants. Every year, DEECET is held for aspirants seeking admissions into D.El.Ed courses that include mathematics, physical science, biological science and social studies. The courses are offered in all government DIETs and private elementary teacher training institutions. The exam is scheduled to be held on May ... The exam will be conducted in three sessions. The candidates have to report to the examination centre one hour prior to the exam time. The exam will consist of 100 questions based on Telugu, Urdu, and English. It will carry a total of 100 marks. The TSDEECET shall be conducted 'ONLINE' in all the erstwhile 10 districts. According to the official notification, the admissions into all government DIETs, government elementary teacher education institutions and Category 'A' seats of the Private Unaided Elementary Teacher Education Institutions shall be made through a single window system in the order of merit on the basis of medium-wise rank assigned in TSDEECET 2019. Medium of D.El.Ed. course: The candidates opting for any particular medium (Telugu/English/Urdu) shall exercise their option in the online application for appearing for TSDEECET 2019 and the test paper for TSDEECET 2019 shall be in that particular medium only. How do I download my Hall Ticket? Internet based Hall Ticket download depends on various factors like Internet Speed, large number of Applicants trying to download the Hall Ticket at the same time etc. Therefore, if you are not able to download the Hall Ticket immediately, please retry after a gap of 5 minutes or during off-peak hours during the night. Where do I get the REGISTRATION NO. & PASSWORD? Know Your DEECET 2019 Hall Ticket Details: Forgot or lost your deecet hall ticket number, now you can know it details. DIETCET was the old name of DEECET and it means Diploma in Elementary Education Common Entrance Test. This year School Education Department, Hyderabad issued DEECET 2019 Notification. We all know that the DEECET for admission into two year Diploma in Elementary Education Course(D.El.Ed) in Government District Institutes of Educational and Training (DIETs) and Private Elementary Institutions in both states of Andhra Pradesh and Telangana. The DEECET 2019 examination was held peacefully in all districts in May last week. After the complete of evaluation process, results of deecet 2019 i.e marks of deecet were declared in June. DEECET aspirants were checked their results(marks) with use of Hall Ticket Number and Date of Birth on its official website from 1st July. But Some deecet candidates were didn't check their results. Because they were forgotten their hall ticket numbers. DEECET official have received many complaints from the candidates on this problem. They were understood that issue and they have provided an option to know their hall tickets on its website. This is a good news for forgot "Hall ticket Number" Candidates and no need to worry. "Know your hall ticket number details" option has been added recently on deecet official website by DSE officials. So Candidates can know your hall ticket details by entering your ID or Reference ID. If you forgot reference id click on it, after enter your name and date of birth. Then Your details i.e Hall Ticket No, Name, father name Date birth will be appear below on the page. Now candidates can check their deecet marks with use of your hall ticket number. 50 - 50 Vasthe raavachchu..